For those of you unfamiliar with the term, a blue stocking refers to a learned woman, a ‘woman of education’ if you will, who were rare at the time of coining and threw the woman in question in negative light. For yes – though we may forget it, there was a time when women were deemed inferior, were thought weak, hysterical and susceptible to fits, and that the only place for them was safely at home cooking tea and bearing children, and certainly not in a seat of education. The year is 1896; the place, Girton College, Cambridge; Britain’s first residential college for women offering education at degree level. Blue Stockings by Jessica Swale follows the progress of four girls who are the first to arrive at the university, where they are hounded by the men, barred from lectures and, of course, fall in love, while the campaign to allow women to graduate crescendos above their heads. Given that this is a play about women’s rights to education and their long-fought battle for it, Blue Stockings has the potential to be preachy and melodramatic, but it is no such thing – it’s calculated, restrained and very sweet, with (aptly) no ‘hysteria’ at all. The script is fresh, the jokes simple, and the acting well-executed and constant among the whole cast. This light and humorous play brings to forefront the importance of keeping these subjects alive, and reminds us of the shortcomings in our own society regarding gender equality and equal access to education. 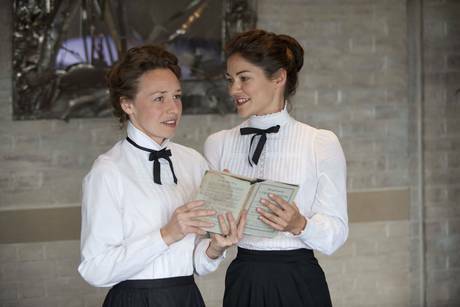 Blue Stockings is running now at the Globe Theatre until 11 October. Tickets from £5 standing. For more information visit shakespearesglobe.com. Londonist saw this play on a complimentary press ticket.